The North Umpqua River is widely known for its challenging Steelhead fly-fishing. Both the river current, and the 8 lb Steelhead can be very strong. This Umpqua is 32 miles of fly only fishing water. 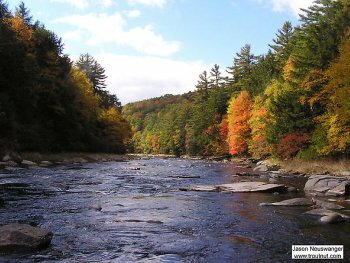 A real haven of fly fishing, especially for those going after the mighty Steelhead. Be sure to read the special regulations for this river. 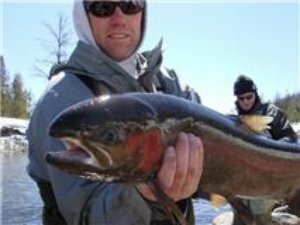 The fly-fishing begins about ½ mile down from Soda Springs Dam, which is about half way between Diamond Lake and Steamboat Oregon along hwy 138. Like most great fishing the best access is on the other side of the river so you may consider crossing the Masters Bridge a few miles below the dam. There are many pools on the lower stretch of the Umpqua River that are great fishing and have good access from pull outs along the highway. Just look for the beaten path and it should lead you to some big fish. This river is not for beginners. The water is fast and challenging making it difficult to get your footing, and the fish are strong. However if you want to try your luck catching a nice Steelhead on a dry fly then look no further. It is no wonder that when people start talking about great fishing in the west, that the North Fork of the Umpqua River always enters the discussion. There are some great streamers and dry patterns that work well on this river so be sure to stop at a local fly shop to increase your odds. This is one of the best Oregon river fishing streams in the state. Leave the North Umpqua River page and return to Oregon page.